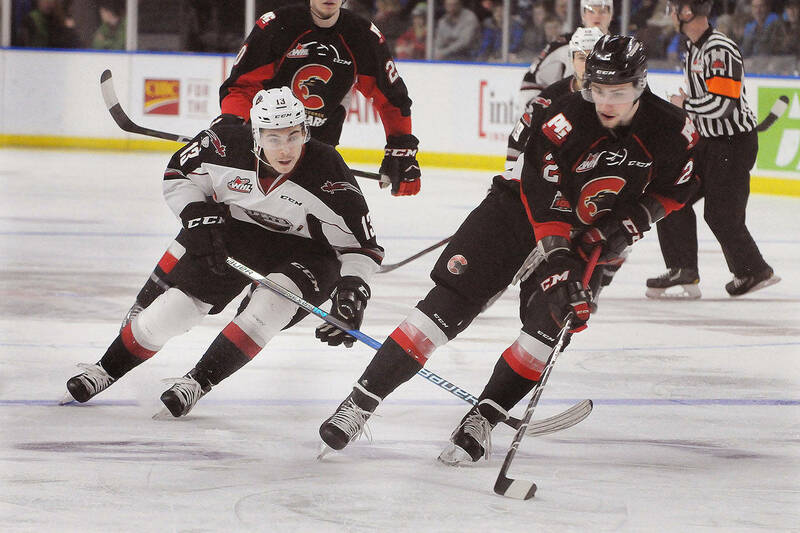 Dec. 30, 2017 10:12 p.m.
Just when it looked like the Vancouver Giants were going to get blown out for the second straight time on home ice, they changed the narrative in an epic way. 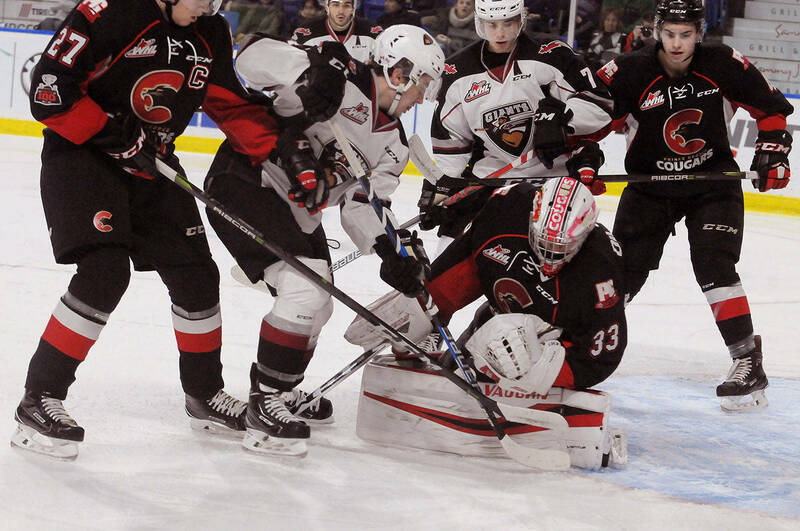 The Giants erased a 4-0 first period deficit against the visiting Prince George Cougars and, up 6-5 with literally no time left in the game, appeared as though they had locked up an improbable comeback victory. With the Cougars’ net empty for an extra attacker, Prince George captain Dennis Cholowski scored with .03 seconds left in regulation to tie the game at 6-6 and send it into overtime. Then, with 11.7 seconds to go in OT and Giants defenceman Matt Barberis in the penalty box for hooking, a seeing-eye wrist shot off the stick of Prince George centre Kody McDonald drifted past Vancouver goaltender Todd Scott and into the net to give the Cougars a 7-6 victory. The goal was McDonald’s 18th of the season and third of the night. Earning a single point was small consolation for a Giants squad that on Dec. 27 was spanked 11-0 on home ice by the Everett Silvertips. And you could hear an audible groan among the crowd of 3,767 fans just 6:46 into Saturday’s game, when the Cougars jumped out to a 4-0 lead. But by the time the final buzzer sounded, the Giants had stomped all the way back, outscoring the visitors 6-1 up until the late game heroics. McKee liked the Giants’ resolve in coming back from 4-0 and, later in the game, 5-2 down. “It could have been easy, considering our last home game and the way it went… it wasn’t the start we were looking for but we stuck with it, and it was a second away from a huge win for us,” McKee said. The Giants were looking for their 20th win of the season, which would have matched last year’s total. Instead they sit at 19-14-2 and are 7-2-1 in their last 10 games. 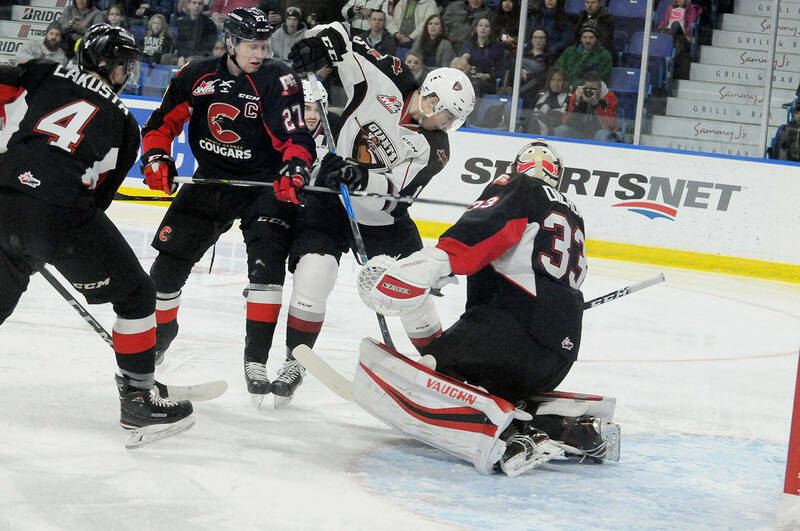 All signs pointed to a Giants win over the Cougars, who improved to 14-18-3-2 with the win. The Giants were coming off an inspired 2-1 road win over the Everett Silvertips on Friday; yes, this same Silvertips squad that blitzed the G-Men two days earlier at the LEC. 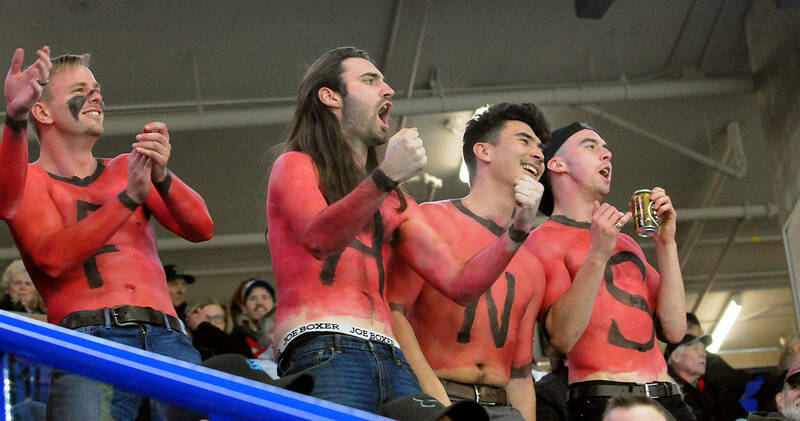 A huge and enthusiastic crowd, including two rows of dudes adorned in red body paint, filled the arena. But the Giants didn’t make it easy on themselves. After all, when you hemorrhage four unanswered goals in the first seven minutes of the game, it’s usually impossible to come back. 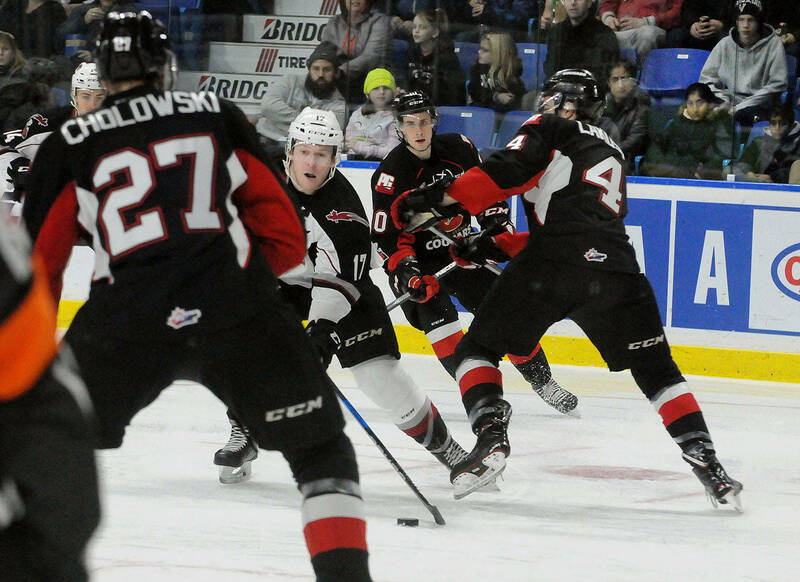 By the 6:46 mark it was four-zip for the visitors on goals from captain, Langley product, and top defenceman Cholowski (1:50 after the opening puck drop), Max Krysk (59 seconds later), Josh Curtis (at the 5:44 mark), and finally, Kody McDonald (with his 16th of the campaign 6:46 in). 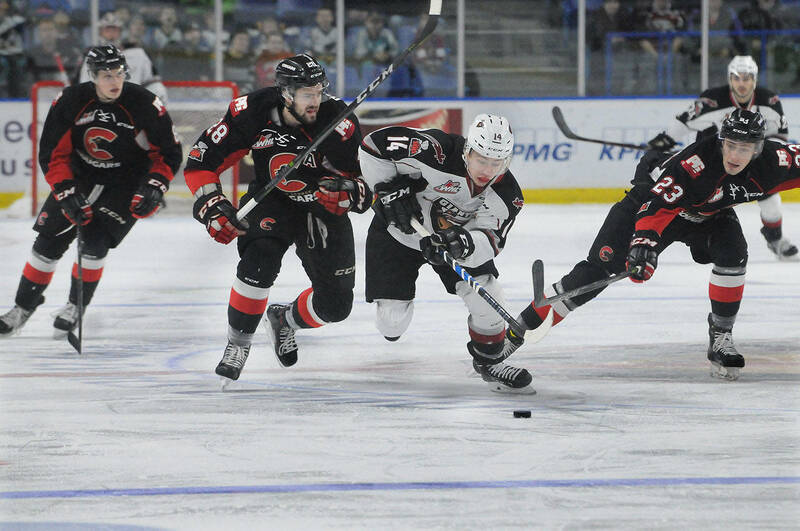 The Giants stormed back on goals to narrow the deficit to 4-2 before the first intermission on goals from James Malm and Ty Ronning. After McDonald scored his second of the night 3:39 into the second period to give the Cougars at three-goal lead again, it was all Giants, or more specificially, Ronning. Ronning cashed in a brilliant cross-ice pass from Alex Kannok Leipert at the 12:36 mark, and then completed his hat trick with his 34th of the season on a nifty tip-in of a Dylan Plouffe shot with 2:45 to play in the middle frame. 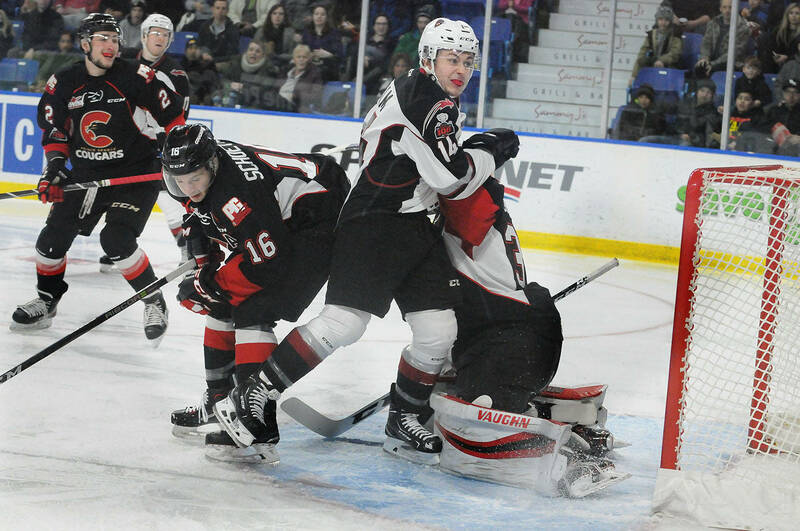 And 3:10 into the third period, the Giants tied the game at 5-5 when Bowen Byram’s wrist shot sifted through Cougars goaltender Isaiah DiLaura’s blocker, as the puck trickled over the goal-line. 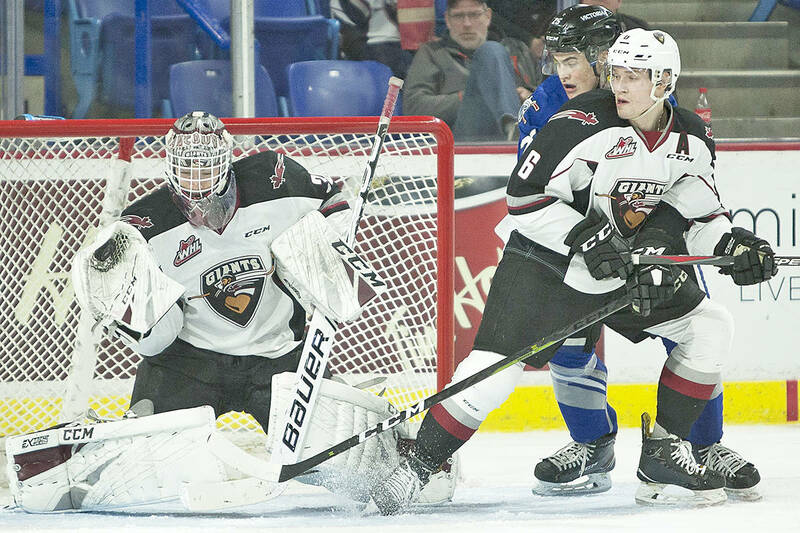 By this time, the Giants were feeling it, and took their first lead of the game 6:45 into the third period as Brayden Watts’ pretty cross-ice feed found the stick of a streaking Jared Dmytriw, who tipped the puck past DiLaura right in front of the net. 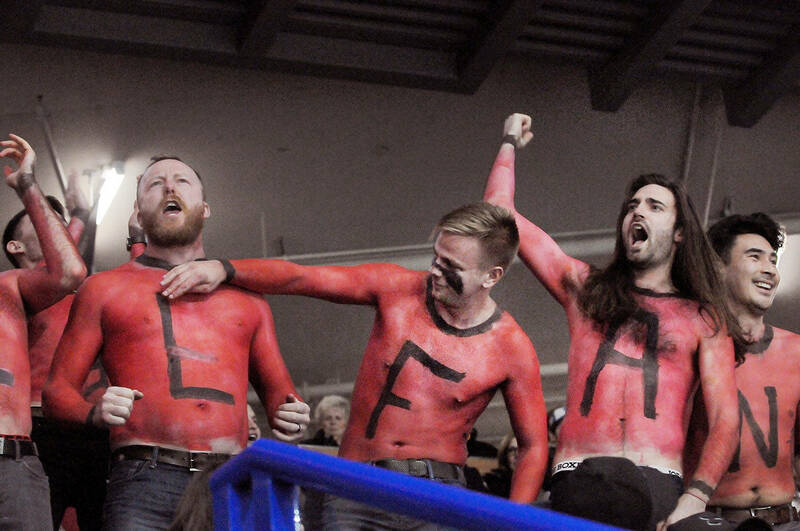 The Giants will rematch with the Cougars on New Year’s Day (Jan. 1) at the LEC. Game time is 2 p.m.
McKee said the Giants players have to learn from losses like this. 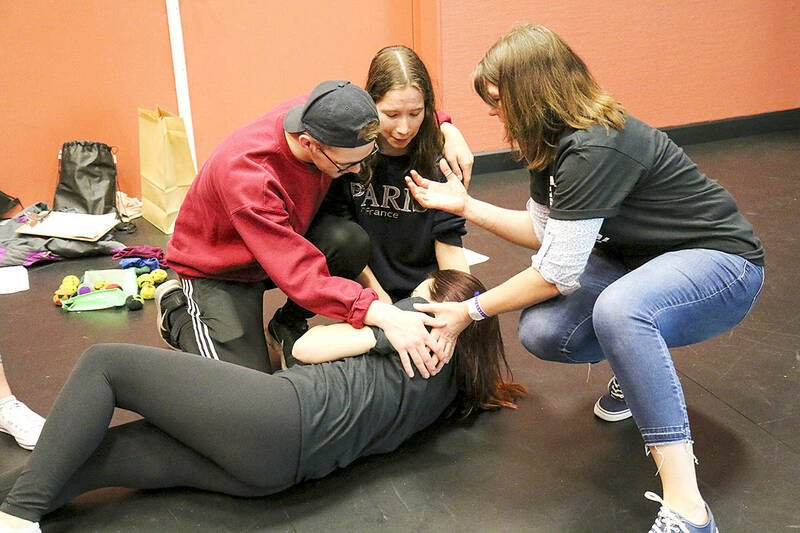 “That’s our jobs as coaches is to show them the situations that they could have done differently and just understanding how they have to manage pucks in certain situations,” McKee said. Despite Ronning’s and McDonald’s matching hat tricks, Cholowski was the best player on the ice. The smooth-skating defenceman and Detroit Red Wings defenceman dominated and ended up with two goals and two assists on the night.